Ten years after he defeated The Kraken, Perseus (Sam Worthington), the demigod son of Zeus, now lives as a fisherman with his 10-year-old son, Helius (John Bell). 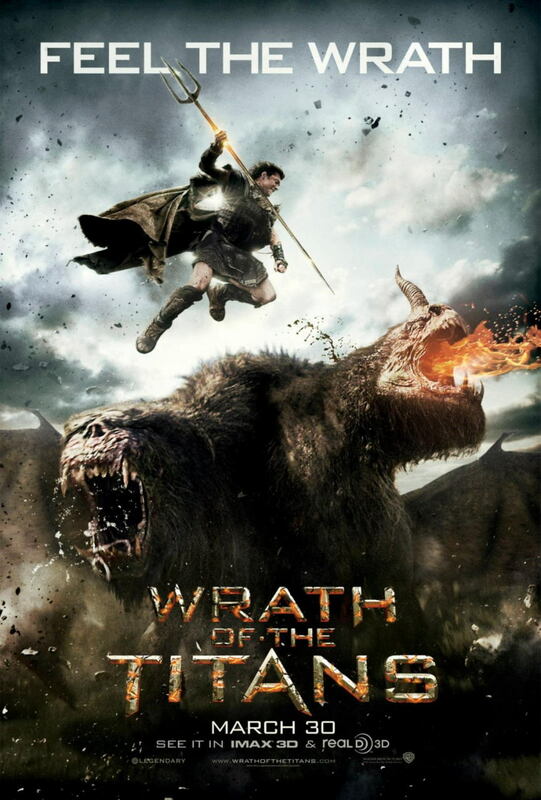 One night, Perseus is visited by his father Zeus (Liam Neeson), who tells them that the powers of the Gods are fading and the walls of Tartarus are breaking due to the lack of devotion from humans. Zeus says they will need the world's armies to combat the potential threat, but Perseus declines to get involved. Afterwards, Zeus travels to Tartarus to meet with his brothers Hades (Ralph Fiennes) and Poseidon (Danny Huston), and his son Ares (Edgar Ramirez). He tells Hades they must forget the past and unite to rebuild Tartarus, but Hades orders his minions to attack. They severely injure Poseidon, and Ares betrays Zeus over showing Perseus more affection, taking him prisoner (Prison Warden: Juan Reyes) and stealing his thunderbolt. Hades and Ares plan to drain Zeus' power to revive their father Kronos in exchange for the two to remain immortal. The walls of Tartarus break, unleashing monsters into the world. One of these monsters, a Chimera, attacks Perseus' village, and after bringing out his old sword and armour, Perseus fights and kills the Chimera. He then takes Helius to the Mount of Idols, so they can speak to Zeus, but the dying Poseidon arrives instead. He informs Perseus that Hades and Ares are holding Zeus in Tartarus, and tells him to meet with his demigod son Agenor (Toby Kebbell) to find the fallen god Hephaestus, who knows the way into Tartarus. Poseidon gives Perseus his trident before succumbing to his injuries and crumbling into dust. Perseus flies on the Pegasus to the camp site of Queen Andromeda's army. Andromeda (Rosamund Pike) has imprisoned Agenor for stealing crown jewels, but Perseus has him released. Perseus, Andromeda, Agenor, and a group of soldiers set out at sea to find Hephaestus. Agenor explains that Hephaestus created the three great weapons that Zeus, Hades, and Poseidon wield: Zeus’ Thunderbolt, Hades' Spear, and Poseidon’s Trident, and that together they form the Spear of Triam, the only weapon that can stop Kronos. Agenor uses the trident to direct the boat to Hephaestus's island, where they encounter three Cyclopes who attack them. When Perseus shows them the trident, they lead the group to Hephaestus (Bill Nighy) who explains that he has a map to navigate the path into Tartarus. He leads them to the door into the Labyrinth, where they are attacked by Ares after a soldier prayed for him to come. Ares kills most of the soldiers while Hephaestus opens the door. Hephaestus then sacrifices himself so that Perseus, Andromeda, and Agenor can enter the door before it closes. Agenor tries to use the map to direct them, but the labyrinth continually shifts. Perseus gets cut off from the group and encounters and kills a Minotaur (Spencer Wilding). Eventually, The group reunites at Tartarus. Meanwhile, Zeus has been almost entirely drained of power and close to death as Kronos starts to awaken. Zeus apologizes to Hades and asks his forgiveness as he forgives Hades for his actions. Hades has a change of heart and finally decides to help Zeus and the human army, but Ares intervenes. Perseus arrives and uses the trident to free Zeus. As they are escaping, Ares throws Hades's spear into Zeus's back. Perseus, Andromeda, Agenor and Hades carry a weakened Zeus down to the base of the mountain where Andromeda's army is gathered. Perseus combines the trident and Hades’ spear, but he still needs Zeus's thunderbolt, which Ares still has. Perseus prays to Ares, challenging him to a fight at the Temple of Gods, which Ares accepts. At the temple, Perseus finds out Ares has kidnapped Helius, who brought him to watch Perseus die. Ares easily subdues Perseus, but is distracted when Helius tries to challenge him by pointing a sword at him, giving Perseus the opportunity to subdue him. Perseus then destroys Ares with Zeus's Thunderbolt and combines the gods' weapons into the Spear of Triam. Meanwhile, Andromeda's army is subdued by Kronos' army of Makhai, but a redeemed Hades and a revived Zeus use what power they have left to defeat the army, who have murdered almost all of Andromeda's men. Kronos then appears and starts to destroy them, in which Zeus and Hades defend them and at the same time are giving Perseus the opportunity to fly right down Kronos' throat. Kronos lets out one last blast, and Zeus takes the brunt of the force to protect Hades. Perseus throws the Spear into Kronos' stomach, destroying him once and for all. Perseus meets with Zeus and Hades. Zeus commends Perseus for his courage, stating that the time of the gods is over before turning to dust. Hades is now human, though he states he might be better as one before walking away. Perseus reunites with Andromeda and kisses her, and then decides to train Helius to be a soldier.